It was crowded on the Friday night when we arrived at one of the new outlet of Sushi Mentai in SS2, opened around May this year. What is so special about this restaurant? The price of the sushi that was the talk of the town recently in Facebook. 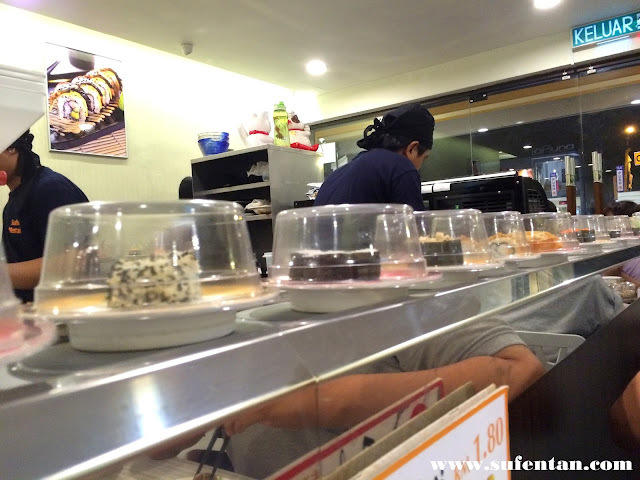 Only RM 1.80 and RM 2.80 for each plate of Sushi on the conveyor belt. 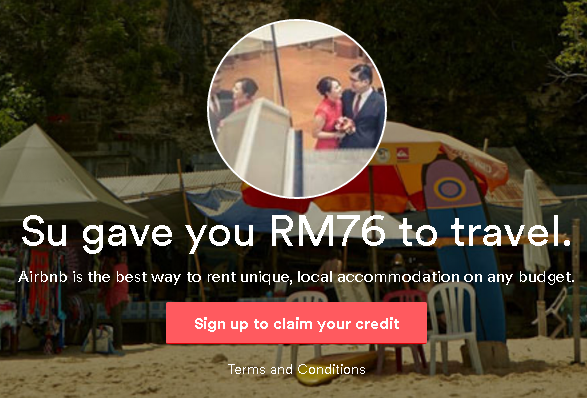 Sounds real good deal to all especially after GST, everything seem to increase price. 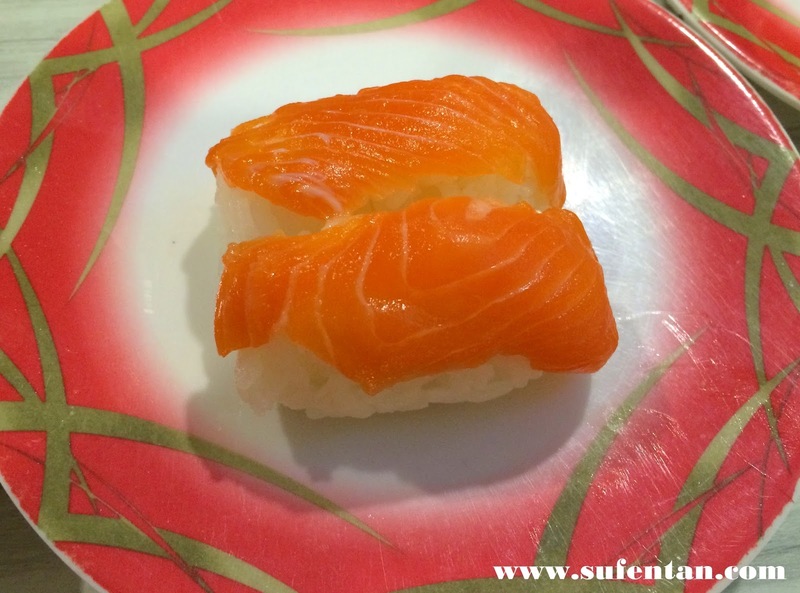 Although the price sounds really attractive, but what about the quality of ingredients they served on their sushi? Today, I'm going to review on their food whether it is worth a try or otherwise. There is 25 type of sushi listed for the price of RM 1.80. The majority of the ingredients used are similar with different dressing. 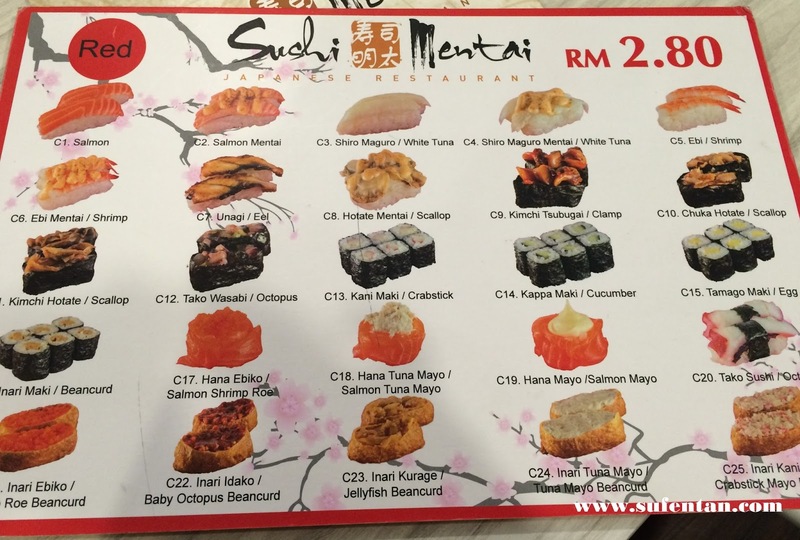 There is also 25 type of sushi listed for the price of RM 2.80. 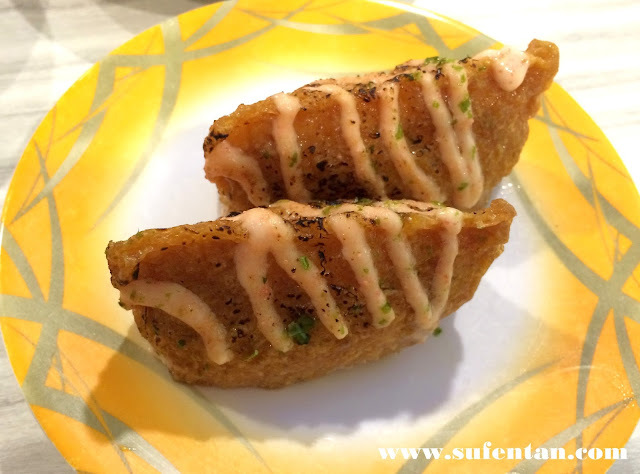 I quite like this beancurd sushi with baked mayonnaise on top. 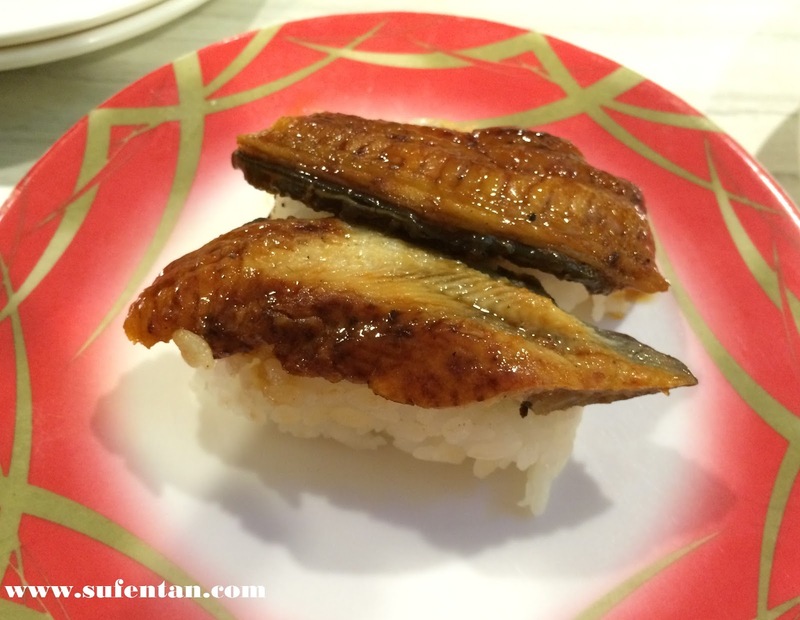 The quality and taste are similar to Sushi King, with that price Sushi Mentai did attracts people to pay a visit. 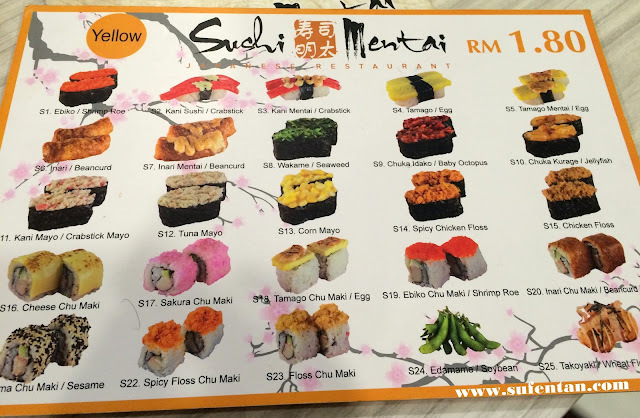 Again comparing to Sushi King, I think no one can resist not to dine here with same quality of sushi and cheaper in price. 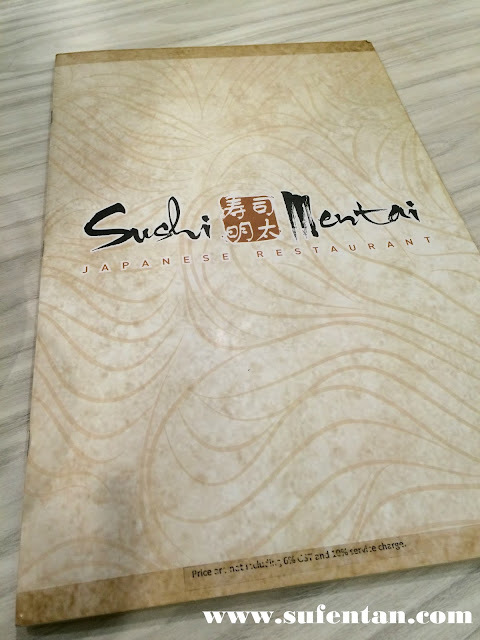 Now, I'm going to review on the items from the menu. Let's see how good does it taste! 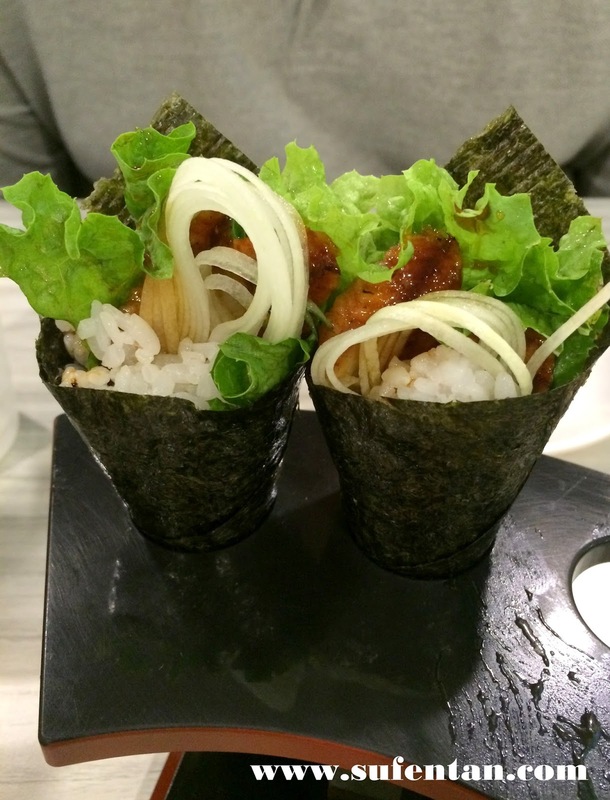 Unagi Temaki taste normal, nothing special. I still prefer the temaki in Sushi Flash which is located at the back of Sushi Mentai. It is another Sushi outlet that served all sushi nothing above RM 3.50. 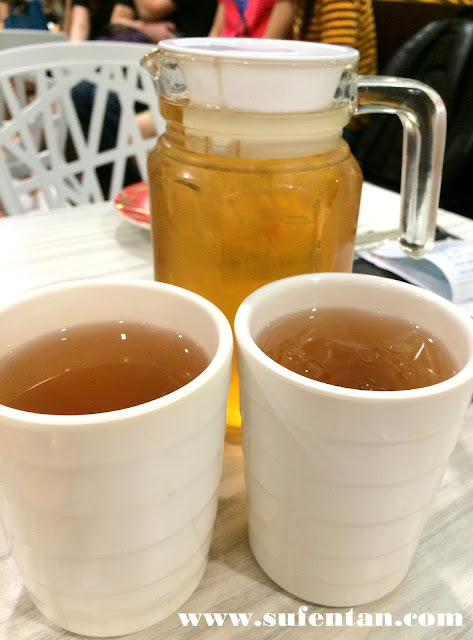 I will share the review soon. 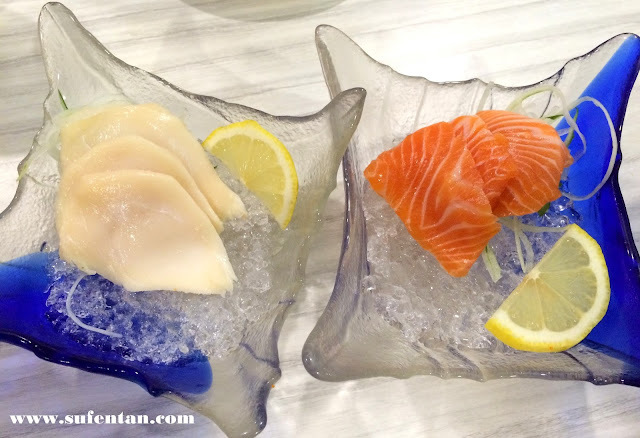 It is hard to find fresh sashimi in this kind of price. If you are a person who don't fussy about premium quality sashimi, I guess this will be the heaven for you on sashimi. Eat all you can sashimi at reasonable cheap price! 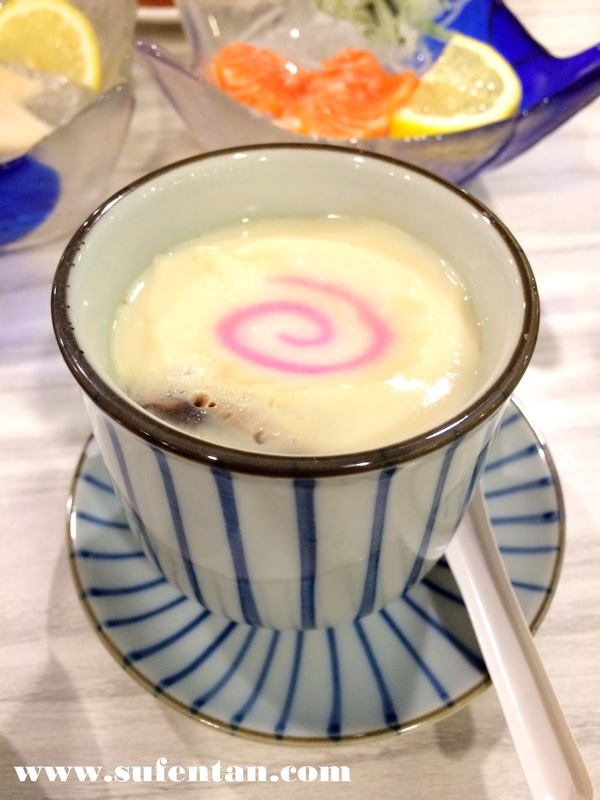 A nice bowl of chawanmushi that I must order when having Japanese meal. Nice! The most disappointed dish we ever ordered. We are expecting soft shelf crab to be at least the size of a man's palm. It appear to be smaller than my palm. 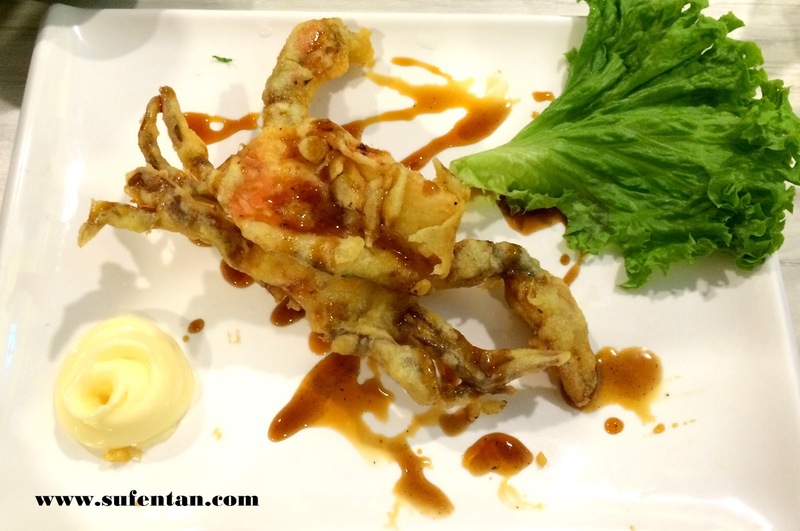 I wouldn't mind if it is good, but this is ridiculously the worst soft shelf crab I ever had. The batter that they used is so hard, no crunchiness on the soft shelf crab, making overall dry and hard. I quite pity the soft shelf crab, for not making it into a nice dish after killing it. 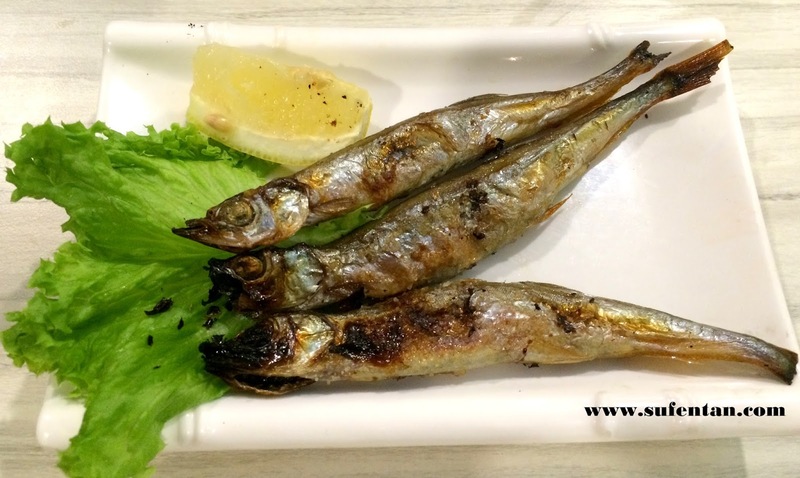 Shisamo is cooked using the Shioyaki (salt-grilled) method which taste quite nice. Crunchy and juicy. I guess ordering their deep-fried items are the worst nightmare I ever had in a Japanese restaurant. 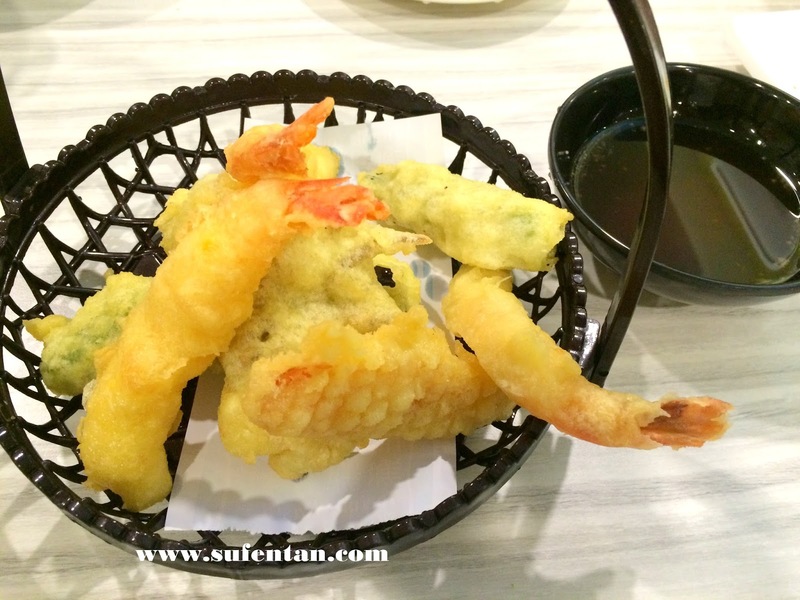 The batter that they used for tempura is similar to the Soft Shelf Crab above. I think you could imagine how it taste like now, I don't have to elaborate more. Overall, I think it is better just to stick on the sushi serve on the conveyor belt, the quality and taste wise are quite similar to Sushi King and you get to save half of the price compare when you dine in Sushi King. In term of the deep fried items, I felt Sushi Flash managed really well even with cheaper price too! I will review on Sushi Flash real soon to have the comparison. No reservations can be made from this restaurant. All seats are on first come first serve basis.